These doughnuts were the very reason I made the rhubarb jam a few weeks ago. 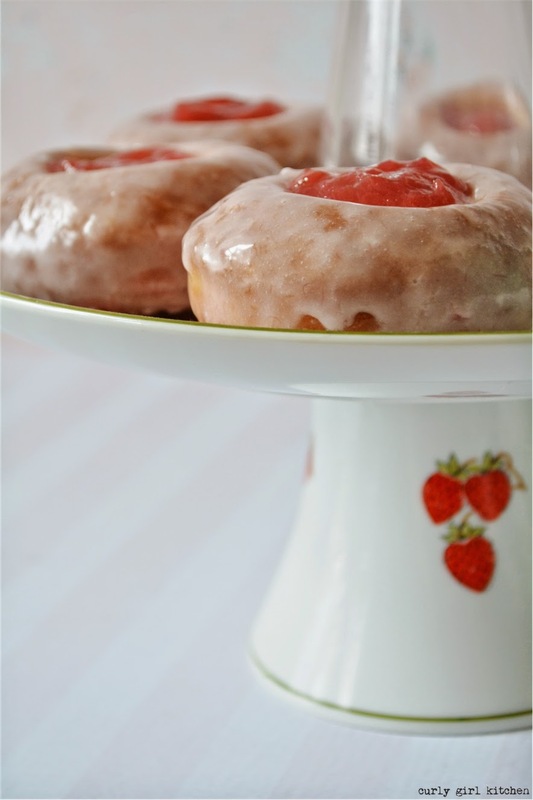 And the jam was wonderful, on its own, or on buttered toast, but jelly doughnuts were what I had promised my husband. 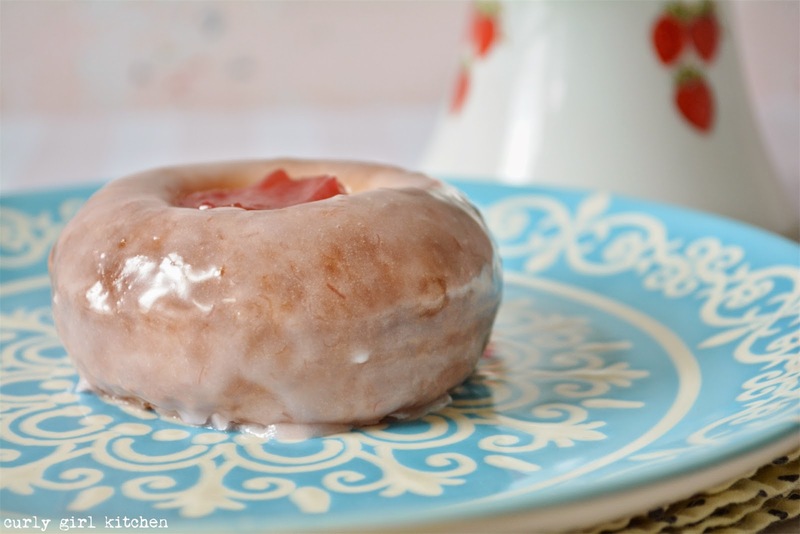 Doughnut making is not something I indulge in all that often, but every few months or so, because they are my husband's favorite sweet thing to eat, I will knead a batch of yeast dough and fill a pot with oil for frying. What makes these doughnuts a little unique is that although I cut them with a doughnut cutter with a hole in the center, I actually fried them with the holes inside instead of removing the holes first. What this does is to create a pillowy soft center that can be partially and cleanly removed, leaving a little well in the center for filling. 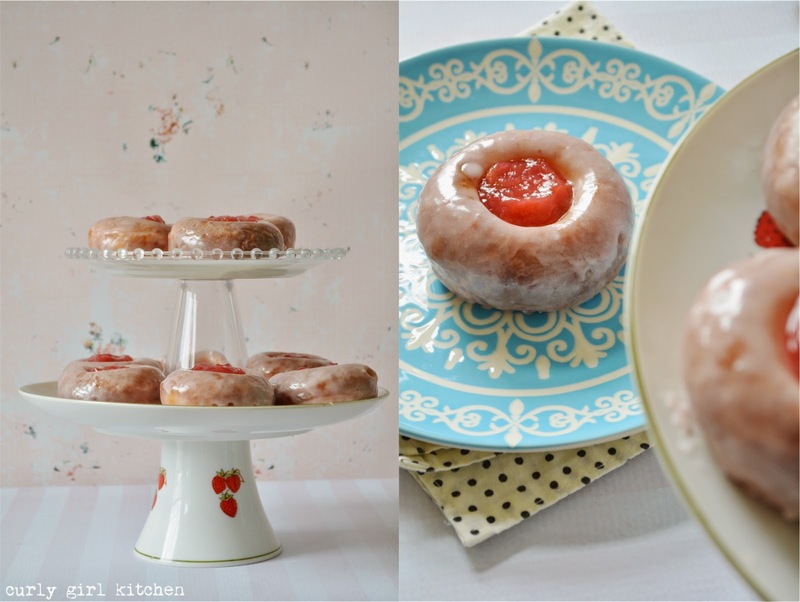 It's just a different way of filling a doughnut, rather than cutting them without holes and piping the filling inside. 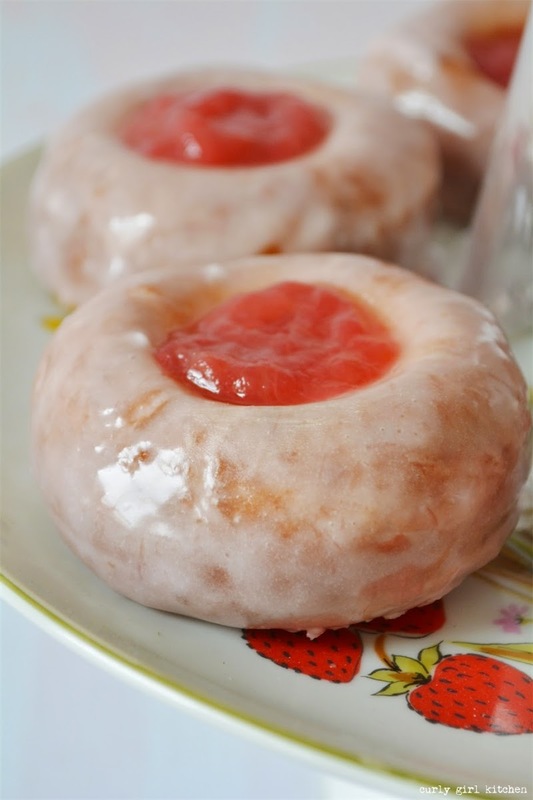 But before filling them with jam, I dipped them in a rhubarb glaze that dries into a sugary shell, encasing the soft doughnut inside. 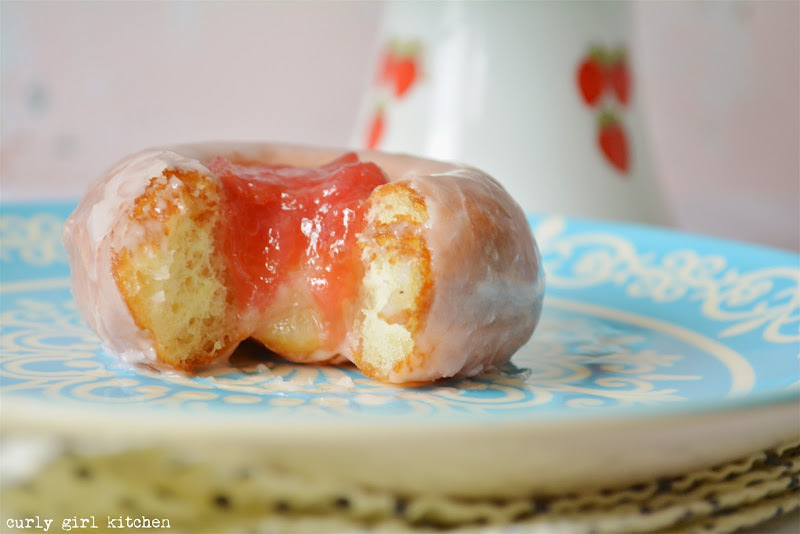 When you bite into one, the glaze gives way to the pillowy doughnut, and the tart rhubarb jam does a little dance on your tongue so that one doughnut is not enough. Not nearly enough. 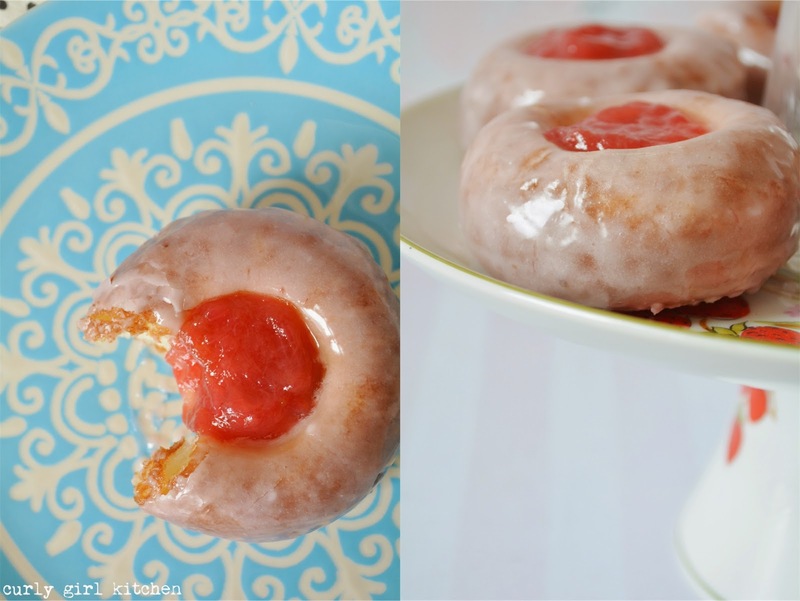 While watching me edit the photos, my husband said that these doughnuts were the perfect combination of sweet and tart, just like the two of us. I asked him, "Who is sweet and who is tart?" He replied, "Well, that's pretty obvious." 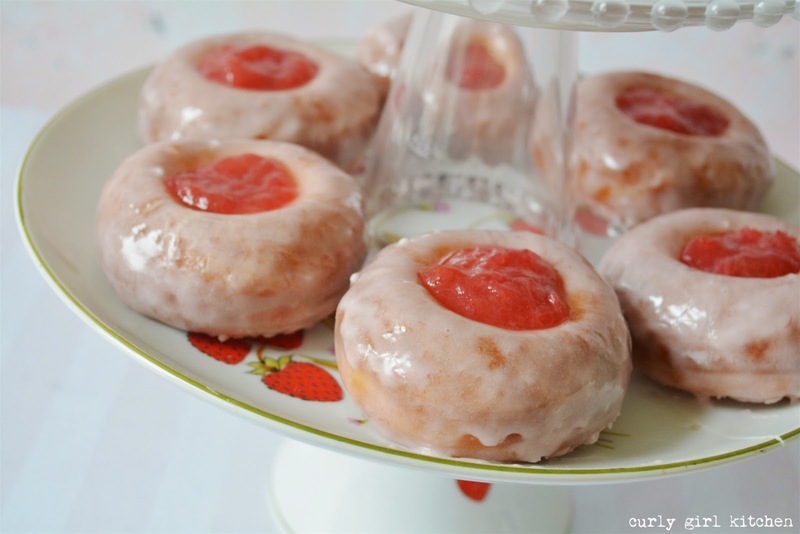 Rhubarb Jam: click here for recipe. Warm the milk and the butter to between 110-115 degrees F. Pour into the bowl of your stand mixer. Sprinkle with the yeast and let stand for 10 minutes, until foamy. Add the egg, sugar, salt, nutmeg and 1 1/2 cups flour, mixing with the paddle attachment to combine. Switch to the dough hook and gradually add the remainder of the flour, kneading for about 5-7 minutes, until the dough is smooth and elastic, springing back slowly when pressed. The dough may be loose and sticky, but don't add any more flour. 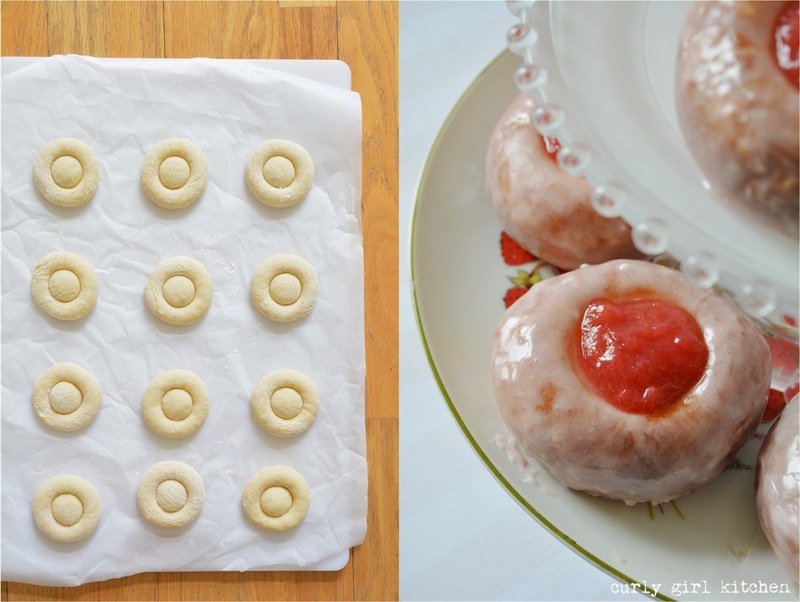 Do not remove the holes from the centers, but leave them in place, and set the doughnuts on a parchment lined baking sheet to rest and rise again while you heat the oil to 365 F.
While the oil is heating, make the glaze. In a blender, puree the jam with the water until smooth, then pour into a saucepan and whisk in the granulated sugar and corn syrup. Whisk over medium heat to dissolve the sugar, then whisk in the powdered sugar until smooth. Keep warm over low heat, whisking occasionally. Fry the doughnuts in the hot oil for about a minute on each side, until golden brown. Drain on a wire rack. Use your fingers to pull out a little of the center, leaving the bottom of the hole in place to act as a well. 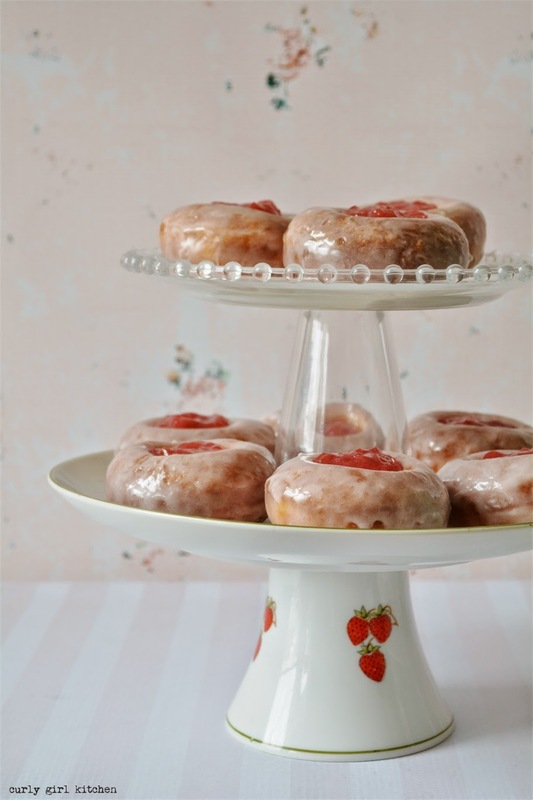 While the doughnuts are hot, dip them into the hot glaze, then place back on a wire rack to let the excess glaze drip off. The glaze will set in about 10-15 minutes. 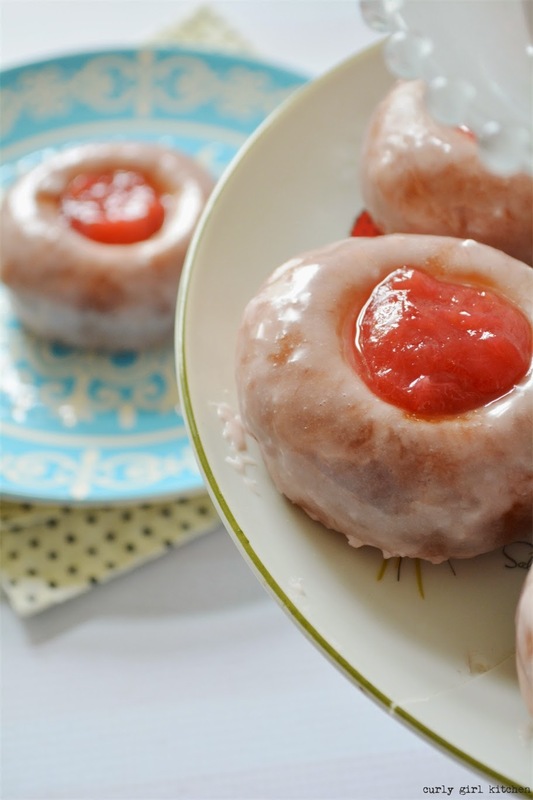 Spoon about a tablespoon of jam into the centers of each, and serve. 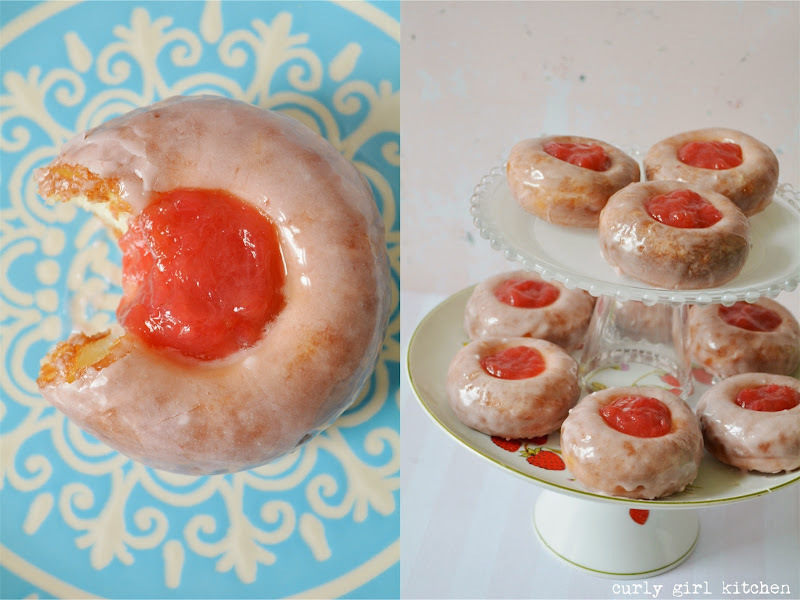 Doughnuts are best eaten the same day they are made.